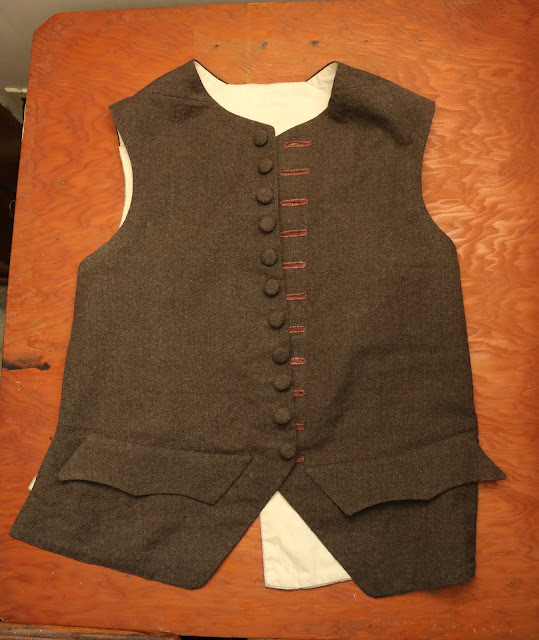 I've noticed that when I get dressed I tend to reach for my plain grey wool waistcoat most often, provided the weather is cold enough. Since I still have a lot of the picked apart wool garments my grandmother gave me (because they were the wrong weight for rughooking) I decided to make another wool waistcoat out of a brown worsted skirt. 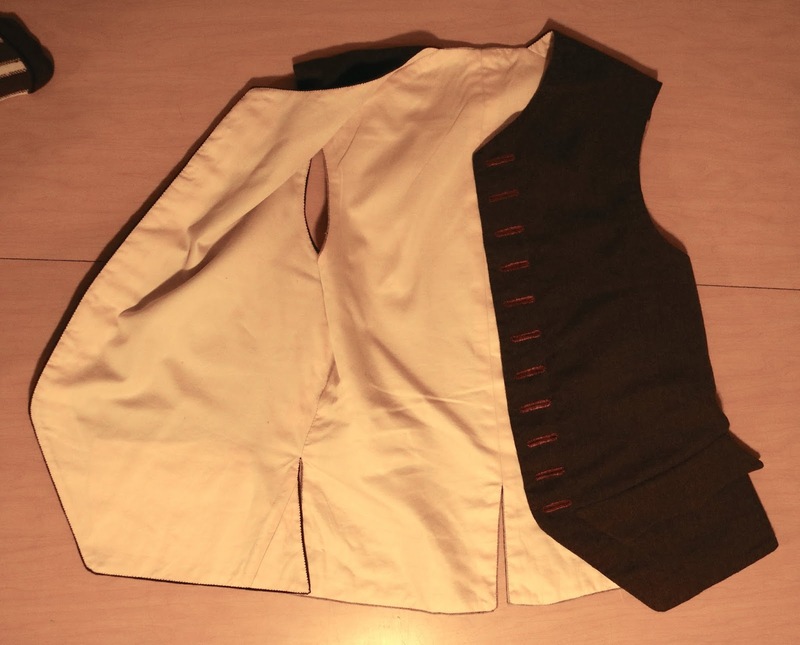 It's probably the most boring waistcoat I've ever made, but I expect I'll get a lot of everyday use out of it. As much as I like fancy silks, I'm reluctant to wear them for things that might get them dirty. I used the same c. 1770's pattern as for my bright green waistcoat, but I extended it a few centimetres because it was a bit too short. I had to piece the fronts in 4 places because the skirt was so small. Two big chunks on the top corners, one small piece on the bottom left corner, and a thin strip along the left side seam. 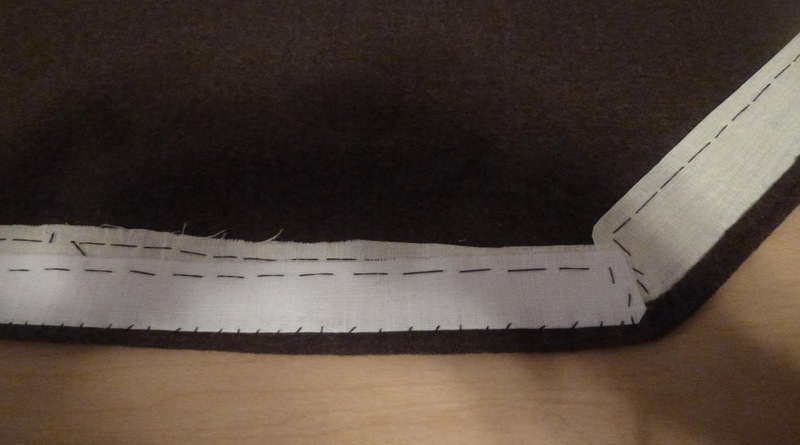 I did this by machine, except for one end of the long strip. I wish modern suit skirts were just a wee bit bigger! 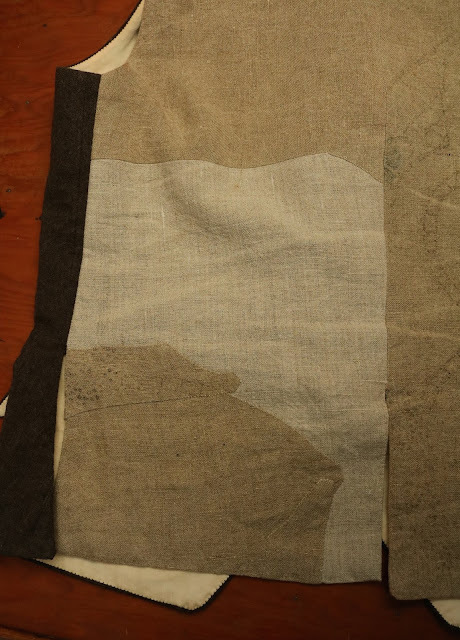 I made buckram by stiffening some linen scraps with watered down fabric stiffener. As usual, I let them dry flat on this window pane. 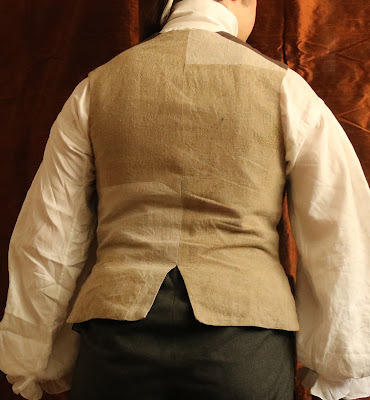 I only recently saw this Burnley & Trowbridge video tutorial on setting in buckram and buttonstands, so I added a buttonstand in this waistcoat. I hadn't previously done that, but I think my buttons are pretty securely attached either way. 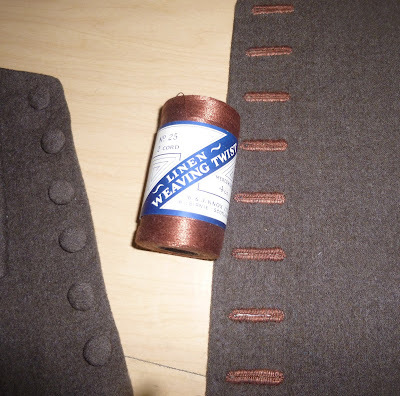 For my buttonholes I couldn't find any thread to match the dull greyish brown, so had to make do with a bright rusty brown linen. 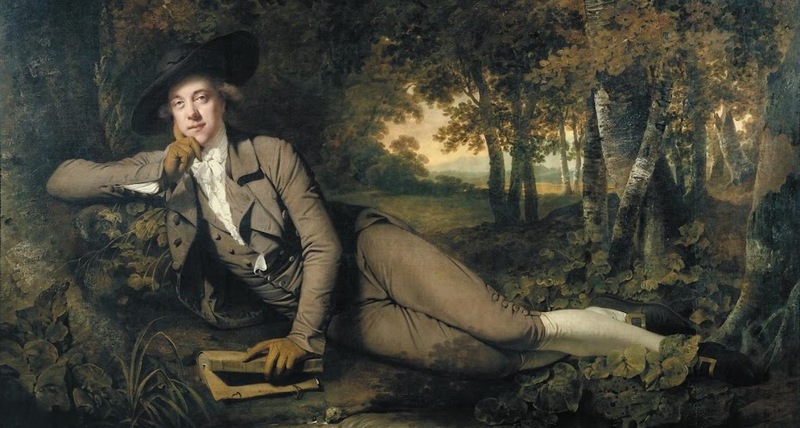 But that's ok, they didn't always have matching thread in the 18th century either. 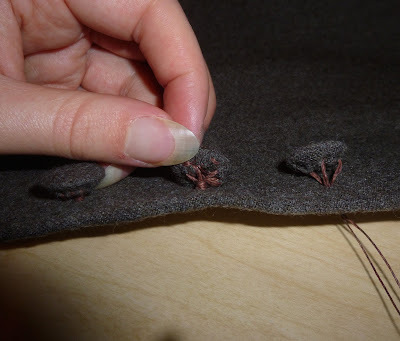 I sewed my covered buttons on with more of the same thread. The pocket bags and the lining are a cream coloured cotton sateen. It's been in my stash for quite a while and I have no idea where it came from. 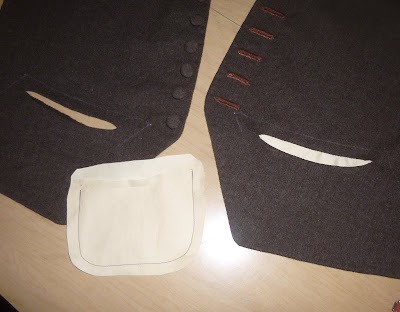 I sewed the two halves of the pocket bags together by machine, and hand stitched them to the fronts. 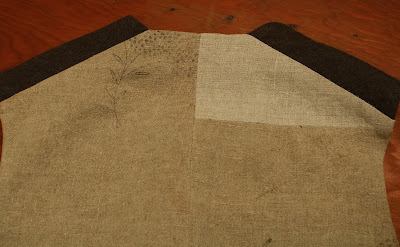 I put the front linings in with le point a rabbatre sur le main, as usual. 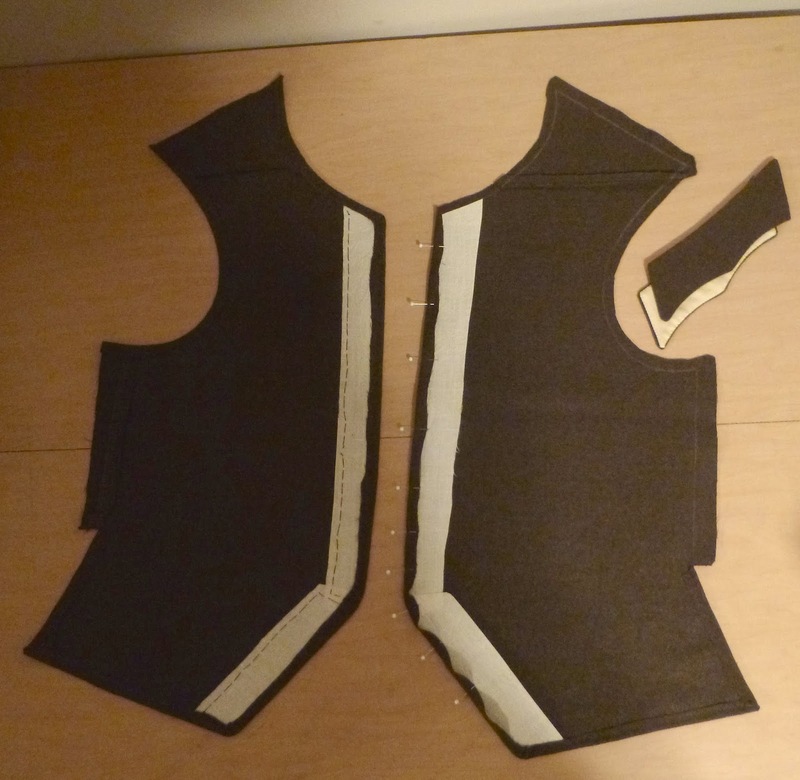 I sewed the centre back, side seams, and shoulder seams by machine, and put the back lining in by hand. 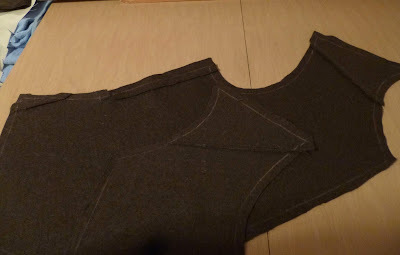 The cotton lining is also pieced on two corners because I only had a narrow strip of it. 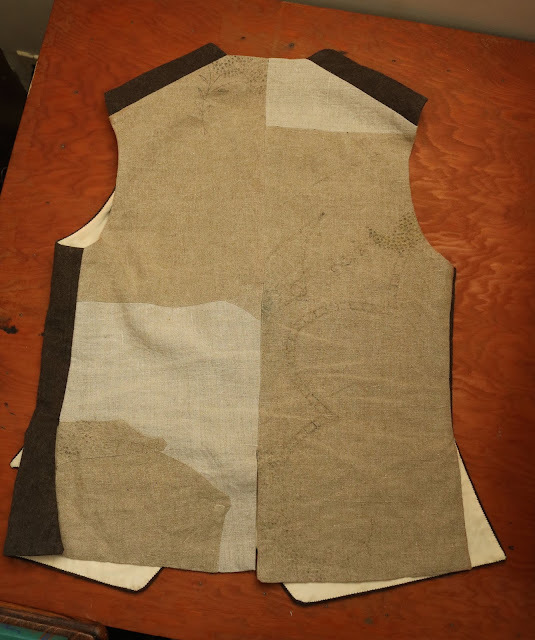 The back is made of brown linen, and in the spirit of re-using fabric and getting the most out of your cabbage I pieced it out of 7 scraps. 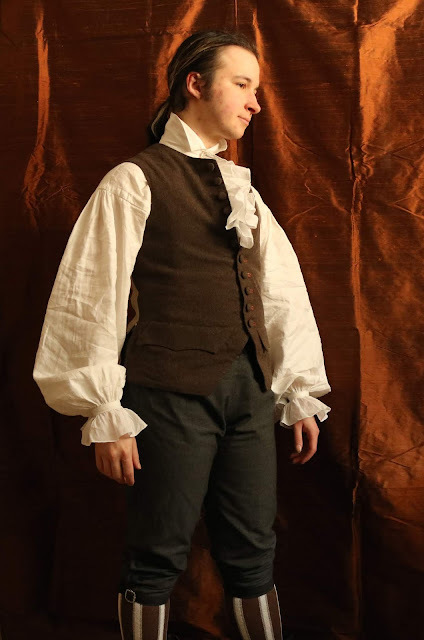 Brown linen isn't something I have a huge amount of, and since I'm not buying fabric this year I'd rather save the bigger pieces for fancier waistcoats. 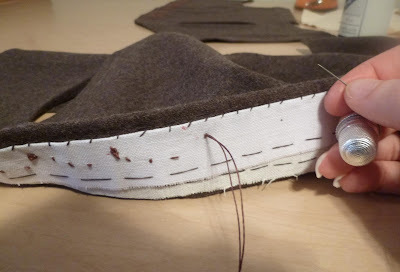 Besides, I like piecing. I think it makes this boring waistcoat more interesting, and it's a very 18th century thing to do. The lines on the darker pieces are because it was from an unfinished embroidery that I found in my grandparents attic. (An ugly, possibly 70's embroidery in a gross synthetic thread.) I meant to cut it so the lines on the big piece were on the wrong side, but I accidentally pieced two left halves, and so had to pick out that seam and flip it around. The straight seams on the back are by machine, and the curved bits are by hand. 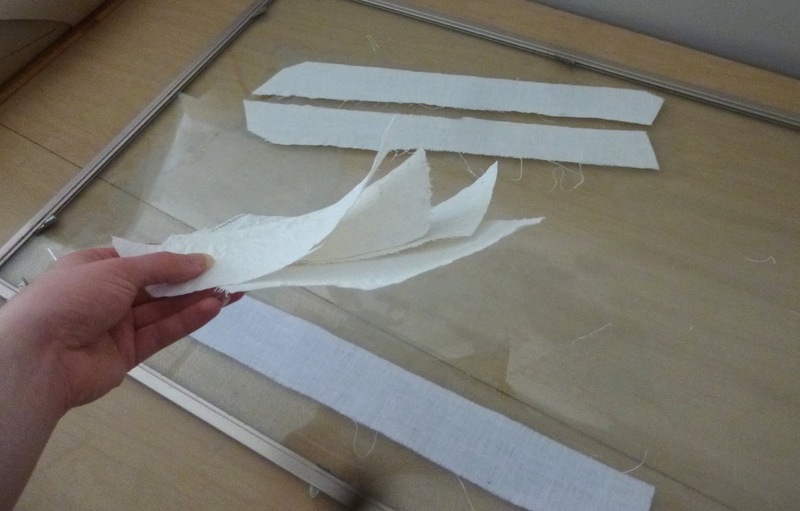 This month's HSM challenge was "Sewing Kit - Create an item that makes use of your favourite sewing tool, instrument, or gadget; or an item made for your historical sewing kit". 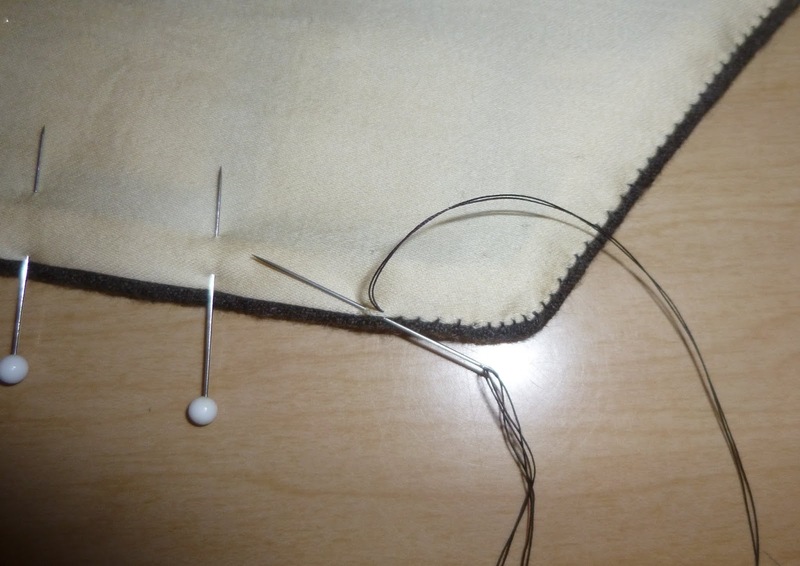 I was a bit conflicted about what to submit for it because my favorite tool in my sewing kit is probably my antique silver thimble, and since I use it for nearly everything I sew that feels like cheating. 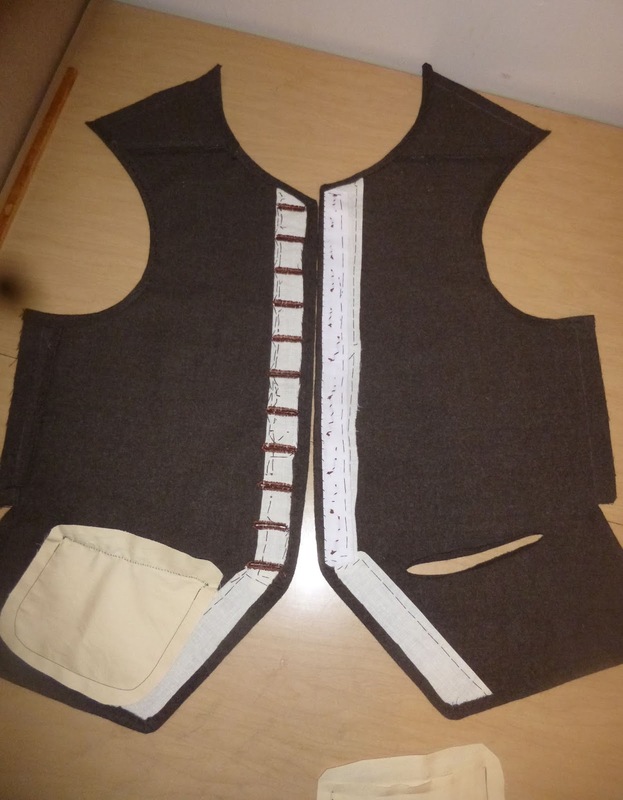 But a few weeks ago I realized that the waistcoat I was working on also made use of my buttonhole cutter, which is a tool I quite like, and only bought less than a year ago. It's just a small modern one, and nowhere near as nice as 18th century buttonhole chisels, but good and useful all the same. How it fits the Challenge: I used my buttonhole cutter (and my thimble) on it. Material: Wool from a thrift store skirt, cotton sateen for the lining, scraps of brown linen for the back. Notions: 11 wooden button molds, buckram, brown silk thread, heavy brown linen thread, fine white linen thread, a bit of polyester thread for the machine sewing. 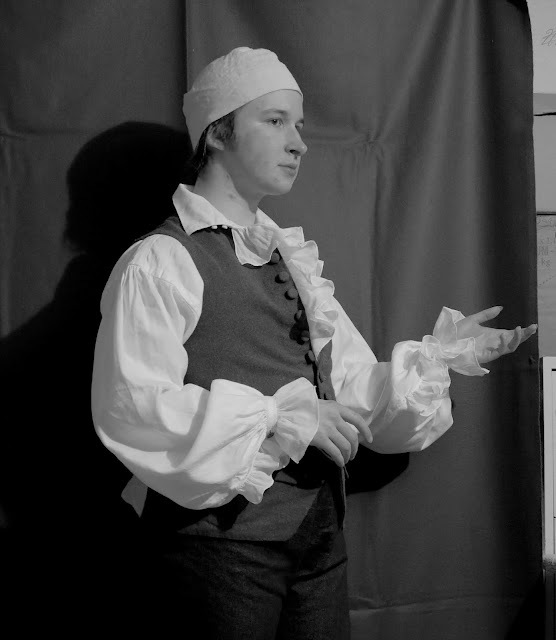 How historically accurate is it: Pretty good. 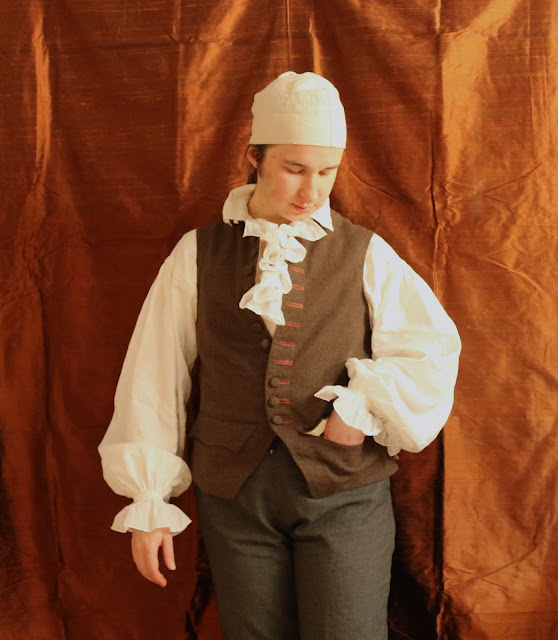 The materials and construction are mostly accurate, and it's mostly hand sewn. 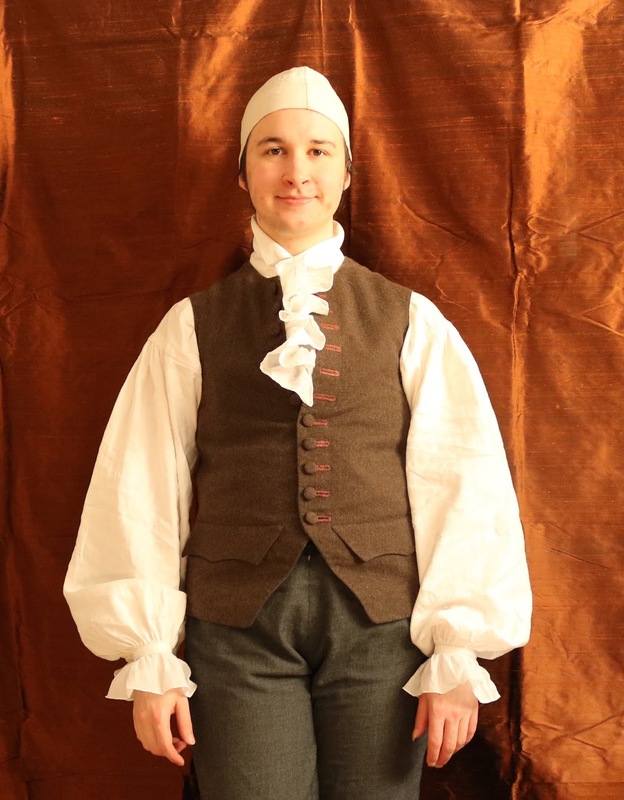 Total cost: Less than $10, because most of the materials were given to me. Not sure how much it would be if I'd bought them, maybe closer to 40 or 50? 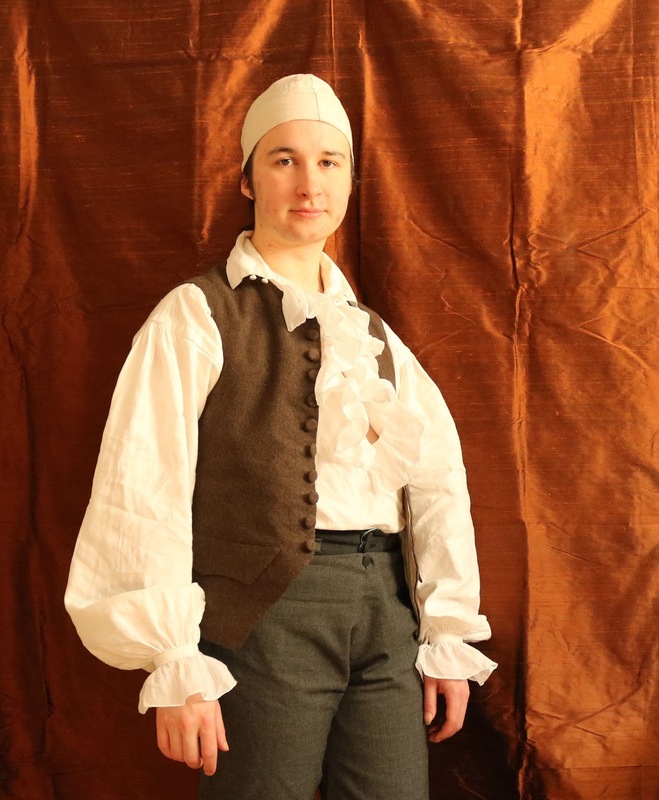 I tried to get good photos of me wearing it last night, but the lighting turned out so horrible and orange that I re-took them today in daylight. 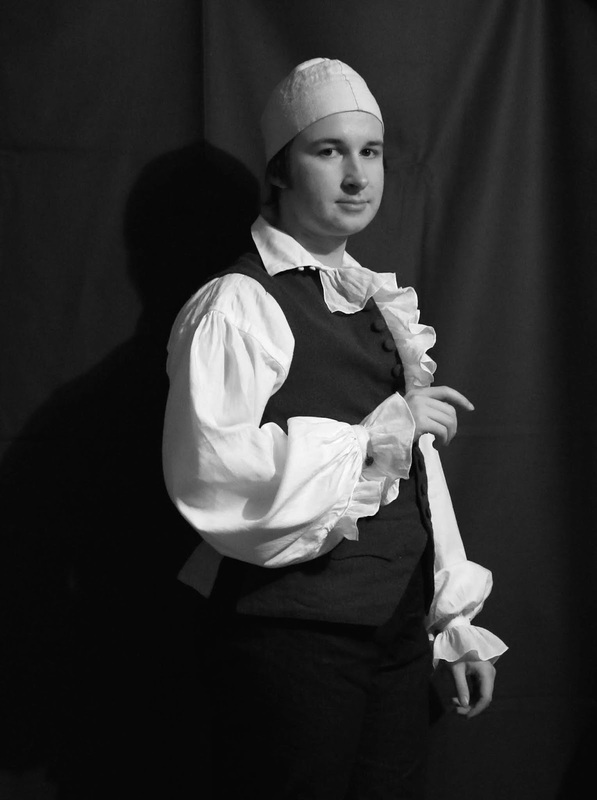 The terrible orange photos looked much ok in black & white though. 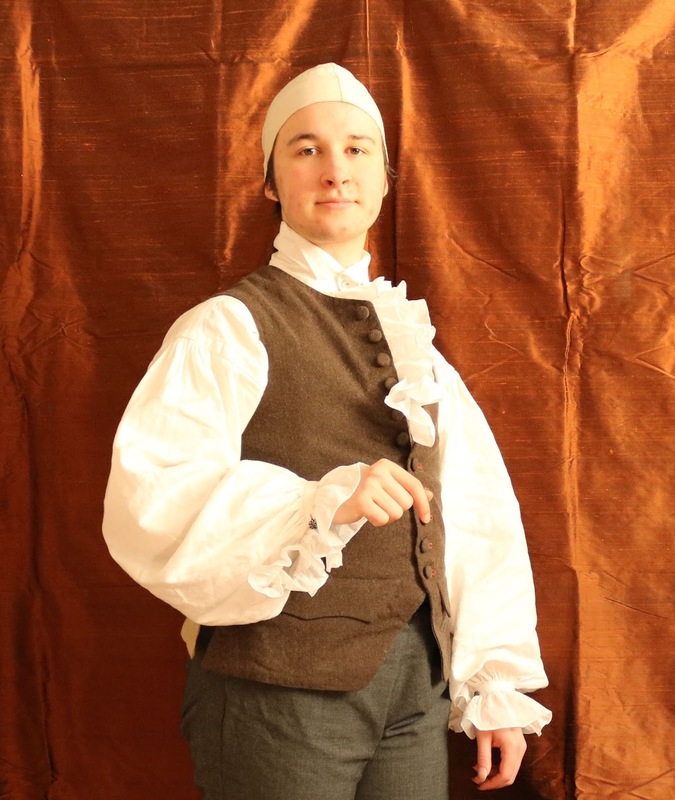 I'm wearing my most recent shirt in these pictures, which I haven't posted here yet. I'm glad that you could use that old wool skirt. You are very creative. I'm glad that you gave me all those bits of wool! 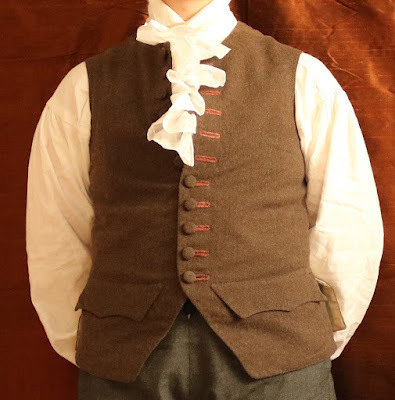 I think there's still several other skirts left that are big enough for waistcoats.